A foldable cuff gutter prevents dripping on the forearm. 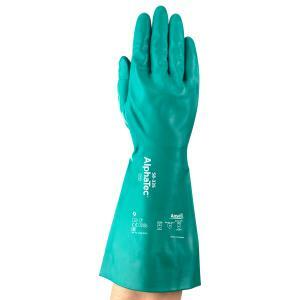 The AlphaTec AquaDri two-layer construction keeps hands dryer for longer and greater comfort and performance. An inner soft foam coating with proprietary AquaDri technology offers unrivalled moisture absorption: 10 times more than traditional cotton-flocked linings on average. As a precautionary measure the superior nitrile film gives advanced chemical protection against incidental exposure to bases, oils, fuels, some solvents, greases and animal fats. The reversed-lozenge finish provides improved dry and wet grip, delivering optimal results in dry or wet conditions. The high-performance nitrile compound offers superior snag, puncture and abrasion protection compared to rubber or neoprene.